Overall Dimensions: 47"L x 30"W x 30"Ht. 80 Lbs. 1 5/8" O.D. all MIG welded frame with walk-thru design. Perforated style Thermoplastic seats and tops with powder coated frame. Available in one, two or four seats. Available in surface or inground mount. Our beautifully designed 30" Square Picnic Table can be had with 1, 2 or 4 seats. Available as inground mount or surface mount with all stainless steel hardware. 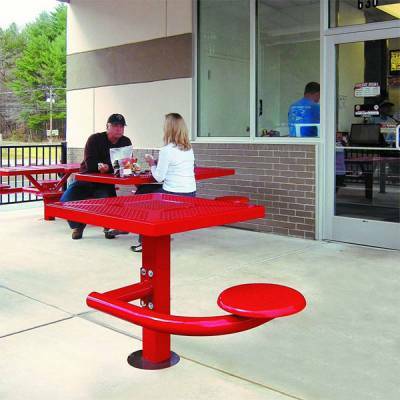 The seats and top are thermoplastic and the frame is powder coated for a durable commercial grade finish. Easy access seating and practically maintenance free makes this outdoor patio table very attractive. Available in many vibrant colors and also has UV fade inhibitors to keep the color bright for many years to come. Our expert sales staff have been helping customers design their outdoor patio needs for over 30 years! Call or email National Outdoor Furniture today for a quick quote!